Fife Flyers forward Bari McKenzie says his team are finally getting their rewards as they crossed the Elite League play-off line. A four-point weekend secured Flyers' place in the quarter-finals in two weeks' time with wins over Guildford Flames and Nottingham Panthers. Dundee Stars are still fighting for the final play-off spot after a key victory in their final home game of the season. Glasgow Clan's season is unravelling as they suffered a sixth straight defeat. Both of the Flyers' matches went beyond regulation time as they kept their recent good form going, now sitting at four wins from their last five. "It's a hard league and we gave ourselves a good chance at the start by picking up the wins, but we've had to battle the last few weeks and we've got the rewards of getting there," McKenzie said. "Getting to the play-offs brings an expectation to Fife after reaching the final four weekend last year. But we're playing well now and it's good to get the confidence going." 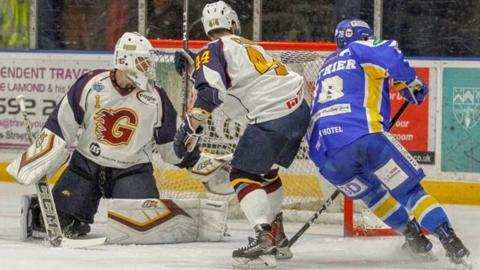 The home double header started with a visit from Guildford Flames on Saturday, with both teams looking for the crucial points that would take them over the line. With Fife taking two for the win in the 3-2 penalty shots success and Guildford gaining the extra one for the game going beyond regulation time, they both made it. Flyers twice fell behind but Brett Bulmer and Joe Basaraba levelled before successful penalty shots from Mike Cazzola and Danick Gauthier settled it. On Sunday, Flyers dug deep again to take a 4-3 overtime win at home to Nottingham Panthers. Fife were 3-1 up after the first through Paul Crowder, Marcus Basara and Carlo Finucci before Panthers levelled. But Basaraba's winner, 12 seconds from the end of the extra period, claimed the second point and victory in Fife. Dundee Stars are two points off eighth place going into the final weekend and Sunday's surprise 3-1 win over title challengers Cardiff Devils kept them in the hunt. Jordan Cownie and Brian Hart struck and Lukas Lundvald Neilsen clinched the points late on. However, the mood at Glasgow Clan is gloomy as their hopes of finishing third ended with Nottingham Panthers claiming the overtime point in Fife on Sunday. Clan's 4-0 loss on Saturday to Nottingham left coach Pete Russell frustrated. Marcus Basara's goal and assist for Fife Flyers on Sunday made it seven games in a row where he's picked up either a point or an assist. The last three wins by play-off chasing Dundee Stars have come at the expense of three of the top four teams in the league. Glasgow Clan were shut out twice in the space of six days, with Saturday's blank coming after Cardiff kept them out in Wales last week.